My Hero Academia has been the latest global hit from Shonen Jump! and has gone from strength to strength, from manga to anime, and now to the big screen, with a live action Hollywood film also on the slate (though whether that’s a good thing remains to be seen…) Kohei Horikoshi’s story about a world where super powers are commonplace and therefore schools exist where kids are trained to use their “quirks” and become heroes has resonated not just with fans of anime, but fans of Western comics as well. As a quick recap, our lead protagonist is Izuku “Deku” Midoriya. Deku was born Quirkless, but his desire to be a hero was noticed by the world’s #1 ranked hero All Might, who revealed to the young boy that his Quirk “All For One”, could be passed from person to person, and that he has chosen him to be the next to inherit the power. He is joined by his classmates from the top hero school “UA Academy”, including his childhood friend-turned-rival Bakugo, the stoic fighting genius Todoroki, the cute and shy girl Uraraka and the straight-laced student president Iida. So how does “Two Heroes” stand, then? Very well, it turns out. 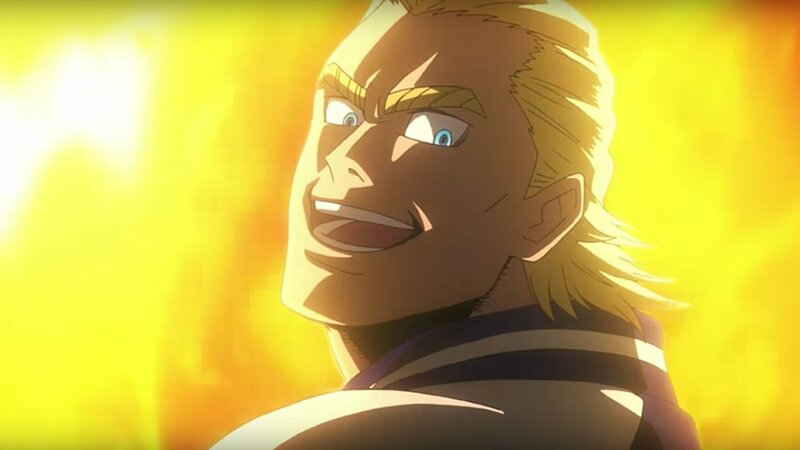 The movie opens up with a flashback to when All Might was a rookie doing an extended tour in the US and teaming with a tech genius named David Shield. Although it was odd to see the Superman-esque hero without his trademark dark eyes, it was great to see him unrestrained. This flashback soon becomes key when we join All Might and his protégé, Izuku Midoriya, as they arrive on I-Island, a haven where scientists and geniuses can work on technology and hero gadgets without fear of villain attacks. There All Might meets up with David Shield’s daughter Melissa, and soon Mr. Shield himself, eventually seeing if Dave can help him with his dwindling powers, while Midoriya and Melissa explore the island. That’s what I’d like to point out, actually. This story takes place within a specific time frame from the show, and is treated as part of the anime’s “canon”, even if it’s unlikely to be actually referenced on the show beyond the single filler episode that set it up from Season 3, but it still makes a change from the usual Jump! affair where the films don’t take place in any established timeline. The animation is beautiful and fluid, the soundtrack is mostly some of the same stuff from the show, but given that is often good to great, that was fine by me. The final battle on the roof is occasionally jaw-dropping, and does a brilliant job in giving the viewer that big, dramatic air-punching climax. The lead villain is a bit one-note, but one of his co-conspirators exists in an interesting grey area. So if you get the chance, I heartily recommend you pop to your cinema and watch My Hero Academia: Two Heroes. While it’s a show where I tend to stick with the original Japanese voice work, now I’ve watched the film dubbed, I can say that FUNimation have done a good job of casting the various characters and matching their unique personalities, so don’t hesitate even if you can only attend an English dubbed screening and it isn’t normally your thing. Just like the TV series has shown how to perfectly pace the manga story arcs, Two Heroes shows how to tell a mini-story in an hour and a half and have it both pull some emotional weight and check all the action-based boxes these Shonen Jump! films always do. Highly recommended. The film will be released in select countries across the UK and Ireland from 4th December 2018. It will be shown both with an English language dub, as well as the original Japanese with English subtitles. 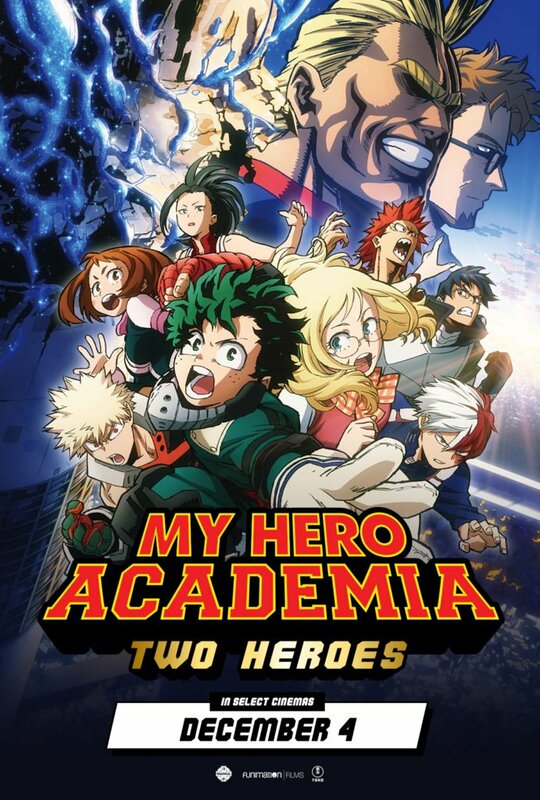 Your nearest showing can be found at myheroacademiamovie.co.uk.